Historic St. Luke’s is grateful for our Board and their years (and in some cases, decades) of volunteerism here at our National Landmark. As a new feature for our blog, each month we will highlight one of our board members. E. Dana Dickens III has been a board member for Virginia’s Oldest Church since 2010. 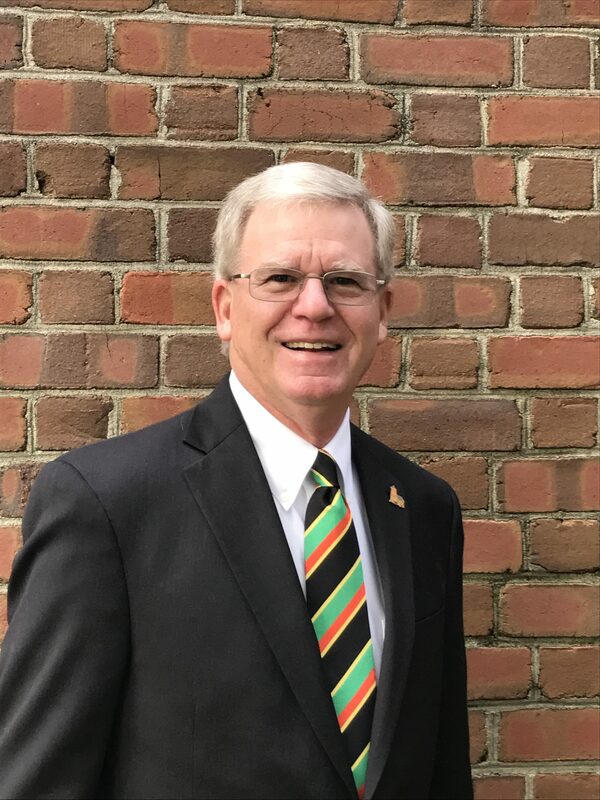 Currently a realtor for William E. Wood, he is our board’s vice president, Development Committee chairperson, and chair of our Major Gift Initiative. Dana has worn many hats over the years, including former mayor of the City of Suffolk, past president/CEO of the Hampton Roads Partnership, and was the vice chairman on the Suffolk Planning Commission. He also served on the Executive Committee of the Hampton Roads Economic Development Alliance and was vice chair of the Mayors and Chairs Caucus of Hampton Roads. Other leadership positions include the chairmanship of the Western Tidewater Water Authority and member of the Hampton Roads Planning District Commission. Dana was also chairman of the High Growth Coalition and had an active leadership role in working with the General Assembly and the shelter industry on growth issues. In 2006, former Gov. Timothy Kaine appointed him to the Commonwealth Transportation Board. 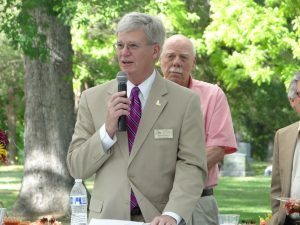 Dana giving a speech during Restoration Day 2016. He has received many honors for his years of community volunteerism. He was selected by the Rotary Club as Suffolk First Citizen in 2003. He was also given the Award of Excellence for the Local Government Elected Official from a city with a population over 50,000 at the 2003 Annual Conference of the Virginia Downtown Development Association. The Virginia Chapter of the American Planning Association selected Dana for their 2004 Leadership Award for excellence in Virginia planning. He was also chosen Elected Official of the Year 2004 by the Virginia Downtown’s Association. And Old Dominion University honored Dana during the 2008 Founders’ Day program with The Albert B. “Buck” Gornto Jr. Regional Service Award, given to an individual who has shown outstanding commitment and service to this region of the Commonwealth. Dana graduated from NC Wesleyan College with a Bachelor of Arts degree in history. He and his wife, Linda Kay Rankin Dickens, reside in the village of Eclipse, located in Northwest Suffolk.